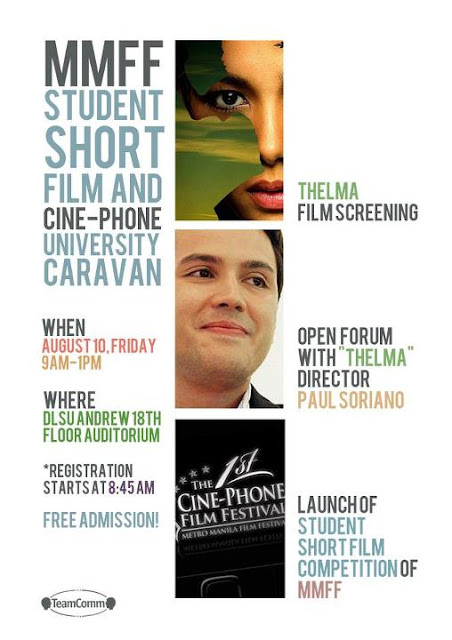 Thelma, the hit film of Director Paul Soriano, will be screened at De La Salle University on August 10 (Friday) from 9am-1pm. Direk Paul will be there too for the open forum. Venue will be in the Auditorium at the 18th floor of Br. Andrew Gonzalez Hall. Together with this is the launching of the Student Short Film Competition of MMFF. Registration starts at 8:45 pm. Admission is FREE.